The crazy thing about hair is it can make or break you...your mood that is. I know that if I've just had my hair done, I don't want to go home because it will seem like a waste. I try to schedule more to do afterward to show off the lovely locks - lunch with a friend, dinner out, etc. I love a good hair product and I've been wondering about the new line of goodies from, yes, Goody (@GoodyHair). 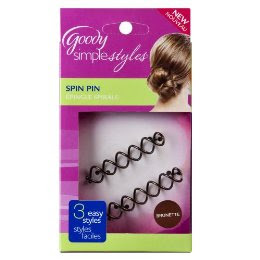 So I did it, I made a last minute decision to run to Target to check out the Goody selection, with mainly one item on my hair (ok, mind) - the Spin Pins. I was thinking that a cute, messy, loose, up-do would be adorable with the dress I was planning to wear. Two words - loved them! I've got fairly fine hair, but lots of it, so it took some hairspray and teasing (Texas style) to get the pins stuck into my hair in a way that I wouldn't be fidgiting with them all night. But it was SUPER easy. I even threw a braid in for a little more dimension. Oohh. I have long fine hair too but tons of it. I always wear it up thanks to the convience if it. These look great. Thanks for the recommendation.